One week before the event we will start publishing the names of entrants and the (probable) race times on our website similar to 2017 (http://www.charlotteville.co.uk/2017_pancakes_competitors.html). It is not possible to finalise these until we have the majority of entrants. On the night before we will finalise the race schedule and publish to the site. 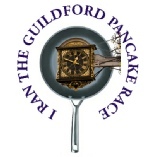 From 10:45AM on 13th February pancakes will be available outside the Guildhall cooked Anne Milton MP – donations are accepted and all proceeds will go towards the Prostate Project..
From 11:00AM (latest) registration opens in the foyer of the Guildhall, GU1 3AA. All entrants MUST REGISTER typically 20 minutes before their race, those who haven’t paid should do so then, cash only please. 11:27 Guildford’s Mayor Cllr. Nigel Manning gives speech and opens event. 11:30 first race gets underway. After each race the winners will receive a winners ticket from the Finish Line Team which should be taken to the prize giving team on the first floor of the Guildhall. 12:20 (TBC) last race usually the Mascots. Back to work or off to the pub. If you would like to enter one of the races, either as a team or as an individual, it would be fantastic if you could let us know as soon as possible. This will make planning the morning much easier. The following should give you a better idea about the happenings on and before the day.